The Practical series katana, wakizashi, and tanto offer excellent quality at a great price. The blades are hand-forged high-carbon steel and are differentially tempered using a traditional claying method to produce a HRC60 edge and HRC40 spine. Tips are a medium kissaki. The hamon is prominent. The fittings are superbly antiqued adding to the aesthetics of the set. 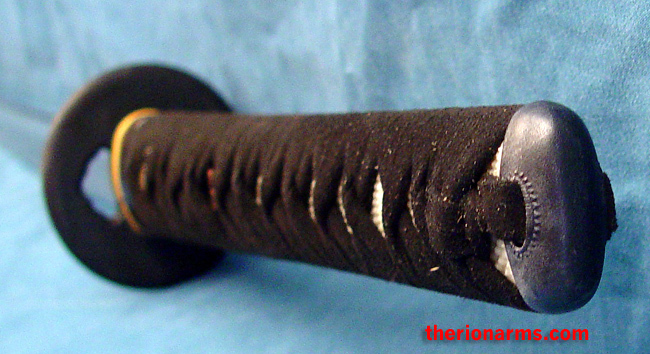 The saya is done in a deep black lacquer and the sageo is black Japanese cotton. The Practical series consists of a matched katana, wakizashi, and tanto. grip and pommel: 11 1/4"
tsuba: 2 1/2" x 3 1/4"